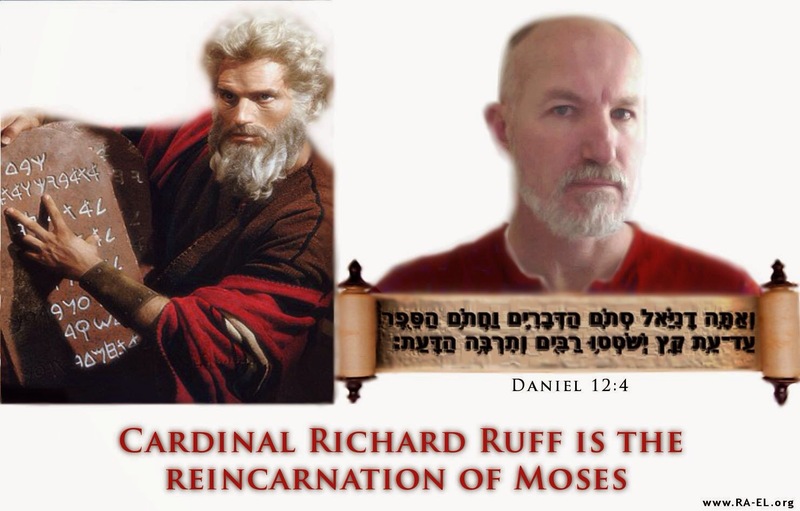 False Prophet Lord RayEL has stooped to an all time low by using and manipulating one of his most fragile appointed Clerics. Lord RayEL is Finished September is over. 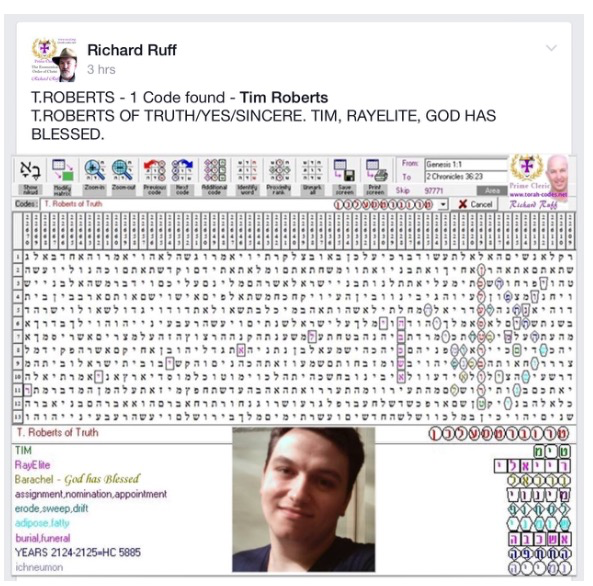 The self-appointed FACEBOOK Guru False Prophet Lord RayEL/convict/Enil/Jesus/King Arthur wannabe and his group of money grubby monks have ONLY gone and done it again. Today’s public announcement in The Congregation of Lord RayEL is just totally ludicrous. At first I laughed, but then as I began to watch and listen to Samantha Kennedy, my heart sank. I’m actually speechless. This video below, is her testimony. Samantha believes that she is the Apostle John. Leon Festinger, is a psychologist who studied groups that predicted the end of the world. He found that most members became stronger than ever when the prophecy failed. His investigation revealed that members had to find a way to cope psychologically with the failure. They needed to maintain order and meaning in their life. They needed to think they were acting according to their self-image and values. Torah Code posted on Samantha Kennedy’s public Facebook Profile on 19th September 2015. The above Torah Code was created by Deacon Robert Cross. 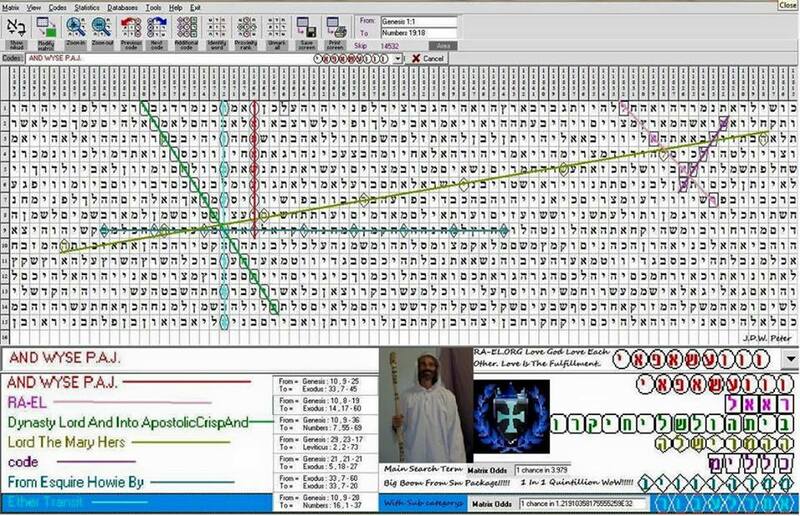 From the Facebook posting, it states “Torah Code, Cloud Lamb and Apostle John A Shock. Many Thanks to Archibishop Samantha Kennedy for suggesting this code”. SURELY THE ABOVE TORAH CODE WOULD HAVE SAMANTHA’S NAME And APOSTLE JOHN ALONGSIDE THAT OF RAYEL IF SHE CLAIMS TO BE WHO SHE SAYS SHE IS ! See donation code below which highlights Torah Code Scam. Samantha Kennedy’s Public Profile Dated 13 September 2015 In the Beginning was the WORD , and the WORD was with GOD, and the WORD WAS GOD. This picture of Saint John was posted. Furthermore, Samantha Kennedy has also posted on her page the following You Tube Videos. Remembrance of past lives can be fascinating, but the real goal of understanding reincarnation is to become free from the painful cycle of birth and death. False Prophet Lord RayEL has played this card before. Cult leaders demand loyalty and suppress criticism. For them, power must be absolute. Authoritarianism takes precedence over anything else. They often claim that ‘special’ knowledge, secret ancient doctrines or divine revelation is guiding them. Timely ! Revealed just before he asked clergy and congregation for donations for his trip to Baja, Mexico. (May, 2015). Not a cheap trip from Australia. Richard Ruff announced he was Moses. Just awaiting now for a miraculous Torah Code to confirm that Archbishop Samantha Kennedy is John The Apostle. This indeed would match the wizardry witnessed this week following Tim (shown above) who gave a sizeable donation to Richard Ruff (Moses) for his trip to Israel following a begging request. 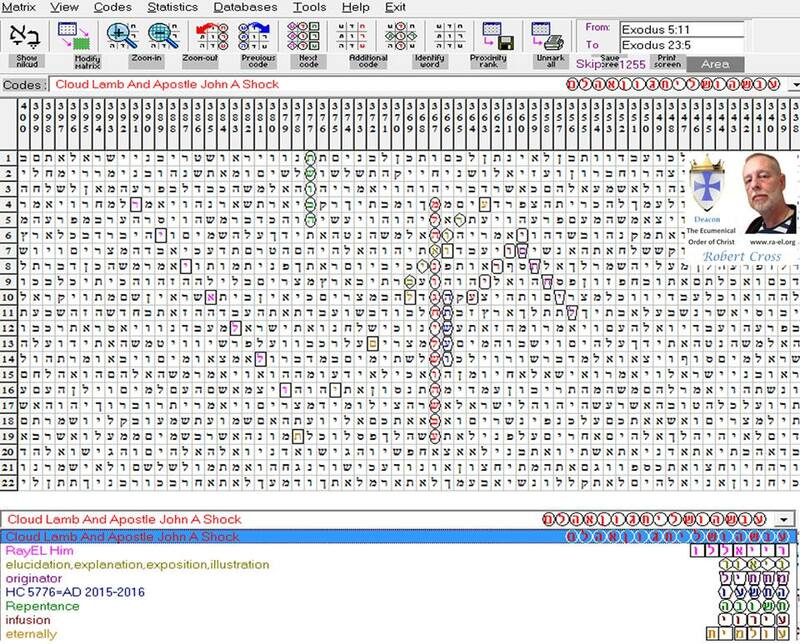 Later Moses found the donors name in a 2000 year old Torah Code. How’s that for sorcery? Cults just like this, use various methods of indoctrination to keep cult members committed: alternative information about other ideas are banned and denigrated; cult ideals are endlessly promoted; and members are kept busy, thus distracting them from observing their changing state and what’s really going on. Highlighted by the numerous apocalypses that did not come true in September. It is surprising to me that David Woolcots torah codes were mentioned here. Was there something in his codes that was upsetting to her. I would like to read those two codes. We already know the torah codes can be manipulated. This is exactly what Richard Ruff does. I doubt seriously that Joseph would attempt to deceive in the name of God. he is passionate about getting his messages from God right. Correction Joseph Woolcot, David Daniels is so much on my mind today. Sorry ! Joseph’s Torah code as Sammy said was spot on. It was to do with her family name. RA-El Is mentioned too. 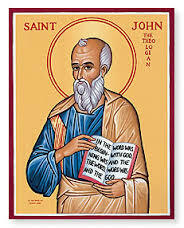 It did not reveal at all – that she was John The Apostle. Richard will tell you whatever you want to hear. Like a whore for the money he will make you king for a day. So does she now 😖. Have you noticed that the Congregation and Moronic Monks have not spoken about this.